The carnauba is a fan palm native to Brazil with a straight, cylindrical trunk that can grow up to 15 metres high. 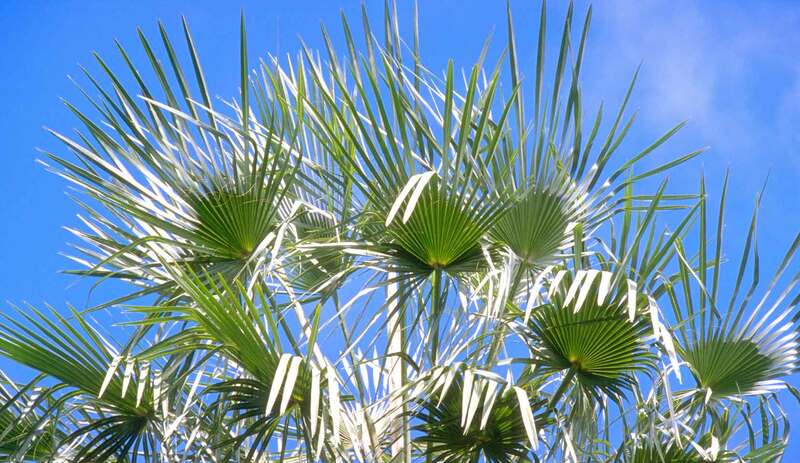 A crown of fan-shaped fronds which may reach two metres in length radiates from the tip of its trunk. Gradually the lower leaves wither and drop, leaving behind a spiral of scars on the trunk. The young leaves in particular are covered on their upper and lower surfaces with numerous wax flakes. The leaf secretes these flakes to protect itself against dehydration. Carnauba flowers produce elongated yellowish berries each containing oneseed. Carnauba wax is a very hard, pale yellow to green wax and has the highest melting point of all the natural waxes (80-88 °C). When mixed with a soft wax it raises the melting point of the softer wax. It is added to ointments, creams and lipsticks to improve their consistency and lend a gloss and is used in pharmacy as a tablet-coating agent. It is also used in the manufacture of vinyl records, in paper finishing and in the manufacture of candles and polishes. This indigestible wax is free from all fragrances and is completely eliminated after ingestion. This makes it suitable for use as a separating agent in foodstuffs such as jelly beans or chocolates with a hard shell, and as a protective coating for apples and citrus fruits (reference number E 903). Fruits with a carnauba coating are labelled 'waxed'. Frederick Clark. Until the outbreak of the Second World War the export of carnauba wax to Europe played an important economic role in many areas of Brazil. Then synthetic substitutes ousted carnauba wax from the market and this export sector collapsed. Carnauba wax protects the skin against external influences. It contributes to the heat stability of the Dr.Hauschka Lip Care stick, Rose Day Cream, Eye Definer, Lip Liner, Lip Line Definer and all lipsticks including Sheer Lipsticks, increasing their breaking strength and providing the desired shine.